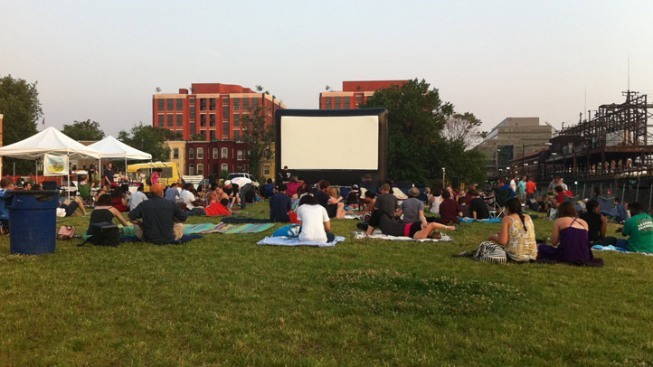 September is almost here, but there are still quite a few free outdoor film series around town. Scroll on for everything you need to know about where and when you can spend an evening in front of the big screen. NOTE: Film schedules are subject to change due to weather and such things. Please check with each movie series' official website to verify dates and times before you head out. Sept. 16: "Whatever Happened to Baby Jane?" Union Market DC Drive-In, Union Market, 1309 5th St NE. Movies start at 8 p.m. Drive-in parking is $10, and ground seating is free. Sept. 21: "The War Room"
Silver Spring: Silver Screens on Veterans Plaza, 1 Veterans Place, Ellsworth and Fenton Street. Movies begin at 8 p.m.
National Harbor Movies on the Potomac -- National Harbor Plaza, 137 National Plaza, Fort Washington. Thursday movies begin at 7 p.m. and Sunday movies begin at 6 p.m.
Sept. 8: "Men in Black"
Sept. 11: "Wreck it Ralph"
Sept. 22: "Meet the Parents"
Summer Movies at The Wine Bin -- 8390 Main St., Ellicott City. Movies begin at 9 p.m. in May, June, July and August, and at 8 p.m. in September. Sept. 3: "My Big Fat Greek Wedding"
Sept. 17: "Star Wars: The Force Awakens"
Oct. 29: "Wizard of Oz"
Cinema Del Ray -- Mount Vernon Recreation Center Fields, 2017 Belle View Blvd., Alexandria. Movies begin at sunset. Sept. 17: "Kung Fu Panda 3"
Northern Virginia Community College: Manassas Campus, 6901 Sudley Road, Manassas. $3 admission. Movies at Arlington Mill -- 909 S Dinwiddie St., Arlington. Movies begin at sunset. Sept. 1: "The Peanuts Movie"
Sept. 15: "He Named Me Malala"
Movies at Penrose Square -- 2501 9th Road S., Arlington. Movies begin at sunset. Sept. 10: "That Sugar Film"
Movies Under the Stars -- Stonebridge at Potomac Town Center, 14900 Potomac Town Place, Woodbridge. Movies begin at 7 p.m.